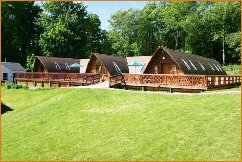 Balbeg Holiday Lodges are situated in dramatic scenery in the Southern Uplands of South West Scotland, some 50 miles south of Glasgow and 16 miles from the county town of Ayr. Ideal for large groups, sleeping up to 16 plus 12 in two separate cottages. The quality self catering holiday accommodation forms part of Balbeg Estate, a 300 acre estate which lies on the slopes of the valley of the Water of Girvan about 2 miles south of the delightful conservation village of Straiton. Enjoy the country life yet still remain within easy reach of Ayr (30 minutes) and all other Ayrshire attractions. Balcraig House is the magnificent south wing of a country mansion. The house has very spacious public rooms, comprising a very large open living room/dining room (30ft x 25ft) with two open fireplaces on opposing ends of the room, and a large south facing conservatory with fantastic views of the hills nearby. The House can sleep up to 10 in complete privacy. If, however, you have a large party, Doonans Cottage which sleeps up to 8 is close by.